While big sister Celebrity Edge has been getting a whole lot of attention over the past few months, Celebrity Summit has quietly undergone a renovation which has made this smaller, older ship worth taking another look at. And that’s exactly what we did during a recent sailing on the fresh-out-of-drydock ship. Celebrity Summit. Photo via Celebrity Cruises. The previous refit put Summit’s amenities in line with Celebrity Cruises’ Solstice class ships. Outside deck on Celebrity Summit has plenty of seating areas. The new-and-improved Summit feels a bit lighter throughout. 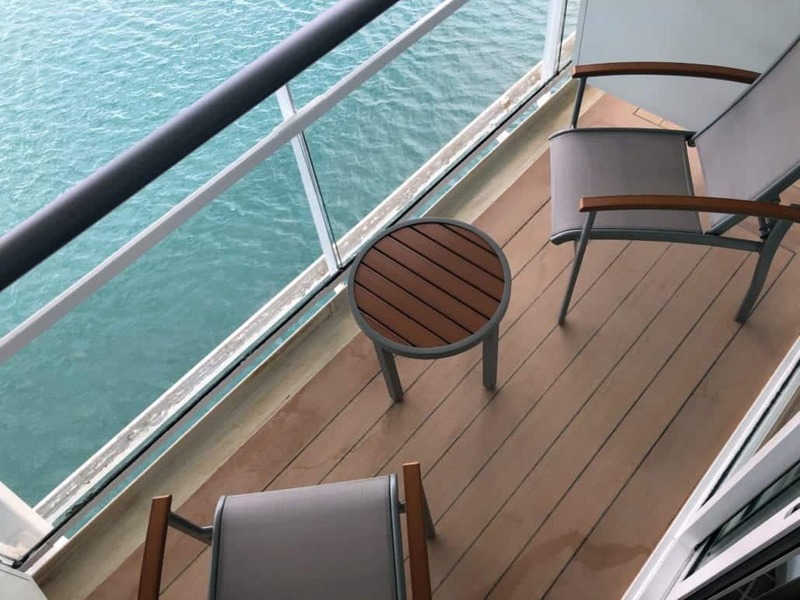 While the ship (and cruise line as a whole) tended to favor darker colors in the past, the new color palette is overall lighter — leaning more toward tan, grey, and shades of gold than the heavy blues and reds of the past. It’s amazing how something as simple as the colors chosen for furnishings and other design elements can transform a space from stuffy to contemporary, as has happened in numerous public areas around Summit. Perhaps nowhere is the before-and-after transformation Summit underwent during the March drydock more evident than in the Cosmopolitan restaurant — aka the main dining room. Some of the changes here are small (like the dark supporting beams being painted white) while others are massive (a stunning new ceiling treatment and all new furniture, including several tables with high-back chairs that offer an almost cocoon-like experience). What was previously a rather average space now has the kind of “wow” factor that causes guests to stop and take pictures the first time they enter. Newly refurbished Cosmopolitan Restaurant on Celebrity Summit. That contemporary vibe is reflected throughout the public spaces on the ship, whether it is newly-created lounging areas or already-established restaurants which were given a lighter, but still noticeable, touch-up. Small touches abound throughout, with many being as practical as they are classy. And some, oddly enough, bring a comfortingly homey element, such as throw pillows on chairs in some of the public spaces. On the of public art pieces on Celebrity Summit. Another thing one notices while exploring the ship is the striking array of artwork on display, including several very fun pieces that are Instagram-worthy. For example, in the pool area, you’ll find a sculpture that looks for all the world like a fellow sunbather stretched out for a nap. (Just try and resist taking a photo with the guy!) And as with just about every modern cruise ship, you’ll find interesting paintings scattered about, especially in the stairwells… which gives you added incentive to take the stairs as opposed to the elevator. Balcony stateroom on Celebrity Summit. When ships go into a refurbishment-centric drydock, the staterooms are almost always included in some fashion. More often than not, it’s simply a matter of changing up the general look of the cabins as opposed to making sweeping changes. But in this case, every single stateroom was not only refurbished but — after being stripped down to the steel frame — essentially rebuilt. The end result is modern in the sense that it is minimalistic, with crisp colors and clean lines. This is an incredibly smart move as it’s a somewhat timeless look, meaning that it won’t wind up feeling dated a few years down the line. As we’ve already discussed with other areas of the ship, the new staterooms not only feel brighter but actually are, thanks to new lighting fixtures throughout the spaces. There seem to be fewer drawers and more shelves, as well as more open space across the various categories. Thankfully, USB ports were installed both on the vanity and by the bedside. And — hallelujah! — the newly-renovated bathrooms ditched those awful shower curtains in favor of glass enclosures. Bedding wise, every room now has Celebrity’s eXhale bedding with cashmere mattresses. If there’s one thing missing from the rooms, it’s a pop of color. The various shades of white, tan and grey — right down to the wall decorations, which are more tapestry than painting — can feel a bit monotone. All in all, 30 new staterooms were added across several categories. Guests staying in suites have access to several exclusive areas, including their own sundeck and restaurant, as well as The Retreat Lounge (which now resides in the space formerly occupied by Michael’s Club). Fun Fact: 80% of the staterooms on Celebrity Summit offer ocean views. Cosmopolitan Restaurant on Celebrity Summit has aft ocean views. Although cruise lines are putting an increasing emphasis on specialty restaurants (all the better to fatten the bottom line, of course) it’s equally important that passengers feel there are both plentiful and quality complimentary options. That’s definitely the case on Summit, beginning with the venue we mentioned earlier: the Cosmopolitan Restaurant, which serves as the ship’s two-story main dining room. The menu isn’t all that different from what you’d find in the dining room of any other mainstream cruise line, with a selection of appetizers and entrees which rotate nightly, as well as “timeless” entrees and appetizers which remain the same. For those who order a bottle of wine and are unable to finish it, the sommelier will actually cork the bottle and serve it at the next night’s meal if so desired. The ship’s buffet — aka the Oceanview Cafe —is set up as a series of stations or islands, each representing foods from different parts of the globe. The stations are mirrored on the port and starboard side, and the entire design makes for fairly easy navigation and a lack of “crowd bunching”, which can happen when cruise buffets are set up as one continuous line as opposed to islands. There’s plenty of seating, including a great outdoor area on the aft of the ship, meaning you can dine al fresco while taking in the incredible views. Plenty of seating in the cafe. At breakfast time, the items are pretty spread out, although lunch and dinner seem a more organized and well thought-out proposition. One of the items I use to judge a buffet is pizza, and what was offered here was pretty solid. Oceanview Cafe on Celebrity Summit is very open. Looking for a grab-and-go meal while hanging out by the pool? They serve up decent burgers (including a veggie burger) and fries at the Pool Grill. Specialty restaurant-wise, the ship offers Tuscan Grill (a high-end Italian steakhouse), Sushi on 5 (which serves exactly what you’d expect) and Qsine, which puts an unexpected twist on some familiar favorites. This last restaurant is quirky enough that it’s probably not for picky eaters. But meals here are as Instagrammable as they are experimental. The coffee shop onboard is Cafe al Bacio, which serves gelatos, pastries, and different coffees. Blu is a dedicated restaurant on Celebrity Summit for Aqua class guests. Suite and AquaClass guests have access to two private dining areas, Luminae at The Retreat and Blu. Fun Fact: When the ship debuted in 2001, the Normandie Restaurant was in the space where Tuscan Grill is now located. This was the line’s nod to the SS Normandie. Wandering the ship, it quickly becomes evident that each of the bars on board has a distinct personality. As a result, people tend to find the one which best meets their needs and become a regular there. Sunset Bar on the aft end of Deck 10. For me, it was the Cellar Masters wine bar (although a close second had to be the Sunset Bar). The latter is located at the rear of the ship on deck 10 and offers not only a very nice watering hole, but also a variety of seating options — perfect for gazing out at the sea — and often, live music. Another popular space is the Martini Bar, which comes complete with an ice-top bar and bartenders who occasionally do some pretty nifty tricks. Right next to the Martini Bar is Crush, which features vodka flights (making it a great place to stop before heading to one of the nightly parties). All the casinos on Celebrity Cruises are smoke-free. One of the big differences between Celebrity ships and their competition is that the casinos, fleet-wide, are smoke-free. As a result, the casino bar can be a pretty popular place, especially on rainy sea days and in the evening. More than a few people could be heard raving (and, of course, complaining) about the fact they could hang out in the casino without dealing with the smoky atmosphere found on other ships. Sky Lounge on Celebrity Summit. The forward-facing Sky Lounge on deck 11 is a great multi-purpose space. While it serves as the nightclub after dark, during the day the floor-to-ceiling windows and comfortable seating make it a great place to chillax. The bar here offers a nice twist by offering a drink for each astrological sign, in keeping with the “sky” theme (which is also reflected in the cool blue colors which dominate the space). The Rooftop Terrace on Celebrity Summit. Rounding out the collection of bars is the Rooftop Terrace, which is on the aft of deck 12 and reminds me of nothing so much as one of those great rooftop bars you find in New York City. There are comfortable chairs (including couches perfect for two), a massive screen on which to watch movies or sporting events, and, of course, a bar offering up all sorts of libations. The entire space is perfect for chilling, taking on a slightly different atmosphere after dark. The vibe feels slightly different… in an oddly inexplicable way. Celebrity Theater takes up levels three, four, and five forward. These days, most midsize ships tend to be big on through-the-decades type shows, and Celebrity is no different. They offer a variety of different production-cast type shows, depending on the sailing. On ours, we took in a performance of December ’63, featuring the music of Frankie Valli and the Four Seasons. I freely admit, I’m not much of a show guy, but these performers really knew their stuff and the audience loved every minute of it. Summit also offers something rarely seen on cruise ships, thanks to Celebrity’s partnership with the American Ballet Theater. Not only can you take in a ballet performance (at which you can, as did I, wonder how the heck they manage to remain on tippy-toe — which I now know is called “en pointe” — on a moving ship!) but sign up for a class. Wander the ship after dinner, and you’ll find live music at various venues. Want to dance to music only you can hear? Hit the poolside Silent Disco. During the day, there’s usually a live band entertaining folks around the pool. The pool deck on Celebrity Summit has a grill and bar. One question people often ask is how “lively” the ship is as the night progresses. While the casino can stay hopping fairly late, and the nightclub can keep people dancing, generally speaking, this isn’t a ship on which you’ll find people rocking out until the wee hours of the morning. That type of crowd tends to go for ships with more bells-and-whistles than will be found on Summit, where the average age range probably skews between 40-60. Fitness Center on Celebrity Summit. Bad news, folks: You likely won’t be able to use “there wasn’t any available equipment” as an excuse not to hit the gym while on Summit, as there’s a nice selection of machines — if perhaps an overabundance of treadmills — in the fitness center. There’s also an upper-deck track on which you can jog, with seven laps equaling a mile. The Persian Garden relaxation area. Directly outside of the spa is the solarium that offers a thalassotherapy pool and complimentary healthy eating options at the Spa Cafe. Let’s be honest: Celebrity is not necessarily the most kid-friendly cruise line. That’s not to say children aren’t welcome and parents won’t find things to keep them busy, but there aren’t waterslides, kiddie pools and splash zones on Summit (or other ships in the fleet, for that matter). Camp at Sea is Celebrity’s kid club, and the spa teams up with them to offer mini manicures, pedicures and the like. There’s also an arcade as well as ping pong, basketball and more for the whole family. A few short months ago, Celebrity Summit was a ship that had, frankly, seen better days. But as so often happens with older ships, an infusion of cash and a TLC-fueled dry dock have helped do something even better than restoring her former glory; it’s brought her into the modern age of cruising in a way that makes the ship worthy of the fleet in which she sails. This ship won’t be for everyone, especially those with young kids, but for cruisers looking to set sail on a ship that feels new despite having been around the block (or should we say the world) a few times, Summit will check all the boxes.